There’s nothing like buying the right asset for the wrong reasons. Buy gold for the wrong reasons and it could be fatal to your wealth. It’s been a good year for gold — up from $1,150 or so at the start of 2017 to above $1,300 now. That’s slightly better performance than the stock market, even with the major stock indexes touching new highs again last week. Now feels like as good a time as any to revisit two persistent myths about gold — myths that Jim Rickards has been working hard to bust. If you’ve been reading The 5 for longer than a year or so, some of what follows might look familiar… but a little reinforcement never hurts. “Men more frequently require to be reminded than informed,” Samuel Johnson once said. The first myth is one that we daresay we had a hand in fostering — albeit quite by accident. Even as gold was nose-diving in early 2013, we identified the ultimate catalyst for the gold price. It’s a scenario our executive publisher Addison Wiggin labeled “Zero Hour” — a moment when demand for physical metal would far outstrip the “paper gold” market of gold futures traded on the Comex in New York. Since 2014, the momentum toward “Zero Hour” has been building relentlessly. Last year, our Byron King explained in this space that for every ounce of physical metal held by the Comex, there are 500 traders holding gold futures. For the time being, those traders are content to roll their contracts forward or take a cash payout when those futures expire. But hypothetically, they have the right to demand delivery in physical metal. The key word there is “hypothetically.” In the years since we identified “Zero Hour,” a lot of internet screamers have latched onto the theme — while failing to understand the subtleties. As a result, many of their followers wonder what the hell’s taking so long. “For years, gold bugs implored futures traders to ‘stand for delivery’ on the Comex,” says Jim Rickards. “But this scenario is unlikely to play out in the way the gold bugs wish, for several reasons,” Jim goes on. So a rogue hedge fund manager out there might want to call BS on the whole Comex scheme… but he thinks better of it, lest the full weight of Uncle Sam’s prosecutorial apparatus comes crashing down on him. If someone demanding delivery of physical metal from the Comex doesn’t bring on “Zero Hour,” what will? It comes back to “avalanche theory” — Jim’s popularization of the science called complexity theory. “A single snowflake,” he reminds us, “can turn a seemingly stable snowpack into a roaring avalanche that destroys everything in its path. Once the snowpack is arranged in an unstable way (like the gold market today), a single snowflake can unleash carnage. Of course, a single snowflake is so small you never see it coming. It could be the bankruptcy of a medium-size gold dealer. It could be lawmakers in Washington talking about new reporting requirements for gold dealers. Or it could have nothing to do with gold: It could be a war or a pandemic that frightens people into safeguarding wealth. “It doesn’t matter,” Jim sums up. “Once the avalanche begins, there’s no stopping it. At that point, the hedge funds can demand physical delivery of gold without fear of prosecution. If a hedge fund tries to start an avalanche, it’s manipulation. But if the avalanche starts from another source, then a hedge fund piling on is ‘normal’ market conduct. “Since every gold market participant knows there’s not enough physical gold to go around, everyone will demand physical gold at once. No one wants to be left holding the bag. “What happens when there’s a panic and everyone demands their gold at once?” he goes on. “And how does this end? Once you have physical gold in your possession, you must confront the other gold myth Jim’s been trying to bust this year — the one about gold confiscation. Here too, many gold bugs are sadly misinformed. A few are informed but try to mislead you about gold confiscation — luring you to buy pricey collector coins on the theory those won’t be subject to seizure, unlike bullion coins. “Gold confiscation” as carried out 80-odd years ago did not proceed the way you might think. It’s not as if G-men were going house to house in 1933 carrying out FDR’s orders. No, people had already voluntarily surrendered their gold during the early decades of the 20th century. As for gold confiscation now? Fact is, there’s nowhere near enough gold in the public’s hands to make it worth the feds’ while. But what about a 90% “windfall profits tax” on gold? So… Follow Jim’s guidance about putting 10% of your investable assets into bullion. Then relax and wait for gold to reach his target of $10,000. As long as we brought that up, it’s worth revisiting how he arrived at that $10,000 figure — seeing as it’s not something he yanked from his posterior just to get attention. It comes back to that avalanche analogy. Each snowflake piles on, one by one, until the whole thing gives way. How can governments restore that confidence? By resorting to some sort of gold standard. Central bankers will take that step not because they want to, but because they have to. But once that decision is made comes the hard part — how to value gold under this new system. When Currency Wars was published in 2011, you could take “M1” — one of the basic measures of U.S. money supply — and back only 40% of it with gold and wind up with a gold price of $2,590. If you took “M1” of the United States, the eurozone and China and gave it that same 40% gold backing, you’d be talking $6,993 an ounce. Of course, there’s been a lot of inflation in the five years since Currency Wars was published — propelling that figure from near $7,000 to $10,000. Next question: At what point will the globe’s monetary mandarins resort to this new system valuing gold at roughly $10,000? To answer that question, we must look to China. 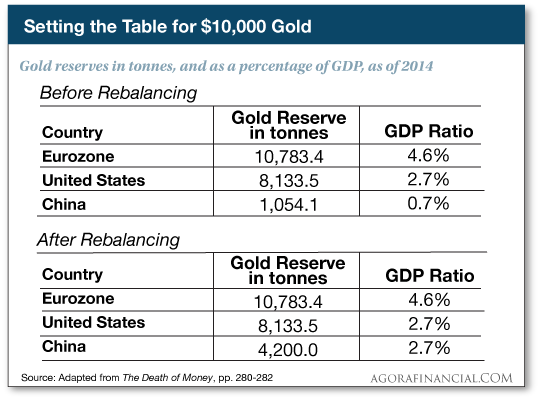 If you’ve been reading us for a while, you know how Jim explains China’s relentless gold accumulation: Chinese leaders want that proverbial “seat at the table” when the global monetary system collapses and the powers that be hash out a new system. In his 2014 book, The Death of Money, Jim laid out the case that Western powers have gone so far as to make room at the table for China. They’re enabling China’s accumulation with the gold manipulation techniques we’ve been describing regularly since 2013. Western central banks have “leased” their gold to commercial banks, and those commercial banks have sold that gold to Asian buyers — including the Chinese central bank. But how much gold is enough to earn China that seat at the table? The metric the power brokers will rely on is gold reserves as a percentage of GDP. When The Death of Money was published three years ago, China’s official gold stash was 1,054 tonnes. But the official figures are notoriously understated. Conservative estimates of the real amount in 2014 was 2,710 tonnes. “Once China has enough gold, the United States and China together could let the price of gold go wherever it wants in an orderly way,” Jim writes in The New Case for Gold. At present, Jim estimates China’s gold holdings at about 4,800 metric tons. The 2.7%-of-GDP threshold’s been met. But Jim suggests Chinese leaders are holding out for more. Much more. They might want a gold stash that equals America’s measured by raw tonnage — in which case, they’re not even halfway there. “When [China’s] done buying, when it has approximately 8,000 tons, the United States and China can shake hands and both say they’re protected. In the meantime, you can accumulate gold with the confidence that all the pieces are in place for a march to $10,000 — nearly eight times today’s price. Get your gold. Then sleep tight. P.S. Gold might take several more years to reach $10,000. The timing is a squishy thing. But something else is happening with gold that Jim says you must know about. — something that prompted him to interrupt his schedule and make an urgent 30-second video. It explains the No. 1 reason why Jim believes one 53-cent penny gold stock could make you a fortune over the coming months. See Jim reveal how to know when the gains will hit… down to the exact day… by clicking here now.